The Fielkow family. Photo by Donna Matherne. Taken from the lyrics of “Feeling Good,” which opened the video presentation at the start of “Starry Soiree,” it was definitely a new day for the Jewish Federation of Greater New Orleans. And in particular, outgoing Federation President Edward Soll said he was feeling good, as Henry Miller took the reins as Federation president. “Tonight we usher in a bold new era,” with Arnie Fielkow having started as CEO of the Federation in mid-August, Soll said. The Sept. 12 sold-out event at the Audubon Tea Room was to celebrate the past year’s accomplishments while looking to the future. “Because of you we’re going to have another 100 years,” Soll said. The evening began with a mention of the flooding in Houston, and “we now have obligations to our east as well” with Hurricane Irma hitting Florida, Soll said. “Given the help we received after Katrina, it is our ethical obligation to do everything we can to help,” Fielkow said, noting that as of that evening, at least $70,000 had been raised locally and a task force was developed to respond to the crisis. Fielkow wants the Federation’s work, and that of the Jewish community synagogues and agencies, better understood by the community at large, and be a public voice for issues affecting the community. After several years of campaigns in the $2.6 million range, he urged those in attendance to envision a Federation that could break the $3 million mark. He also wants to see the Federation known as a “welcoming home for all Jewish New Orleanians,” working with multi-generational natives and the large number of newcomers. 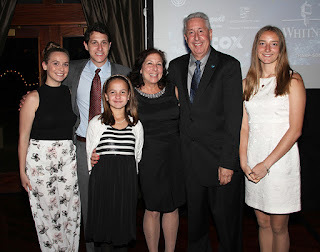 “Our Federation mission is to retain our core values, but at the same time create quality initiatives so that every member of our community – irrespective of age, synagogue affiliation, gender or political belief – feels that Federation offers at least something which is personally appealing and beneficial,” Fielkow said. Miller said the New Orleans Jewish community must always be seen as an inclusive community, whether through welcoming newcomers or working with other faith communities. “It’s time to take that promise and give it real action,” he said, announcing the formation of an LGBT division at Federation, to bring Jewish LGBT members and their partners together for cultural and social activities. He also urged more business mentoring and partnership, retaining young talent for New Orleans. “We can help both New Orleans and our Jewish community prosper,” he said. In a video presentation, Maury Herman presented the Anne Goldsmith Hanaw and J. Jerome Hanaw Tikkun Olam Award for Campaign Excellence to Lisa Heller and John Haspel. “She is a woman of tremendous balance and passion,” he said, and in 2012 the Federation asked her to brainstorm how to get young people involved in the community. Garon said they had a Young Adults Division and a Jewish Graduates program. “Ashley soon realized this was a duplication of resources and she helped spearhead the creation of a new division, JNOLA,” and she was asked to be one of the initial co-chairs. Gold recalled the early days of JNIOLA, saying “we were able to set the tone” for what exists today. “I’m thrilled that my work in the Jewish community continues” as she is on the Federation and Jewish Family Service boards. Emily Kupperman and Dottie Jacobs presented the Cohen-Jacobs Emerging Leader Award to Nicole Harvey. Harvey is chair of the JNOLA culture, education and service committee. “After graduating from Tulane, I decided to stay in New Orleans,” Harvey said. She joined JNOLA to be involved in the community as she had been at Tulane. “I feel fortunate to have been able to make what I hope will a lasting impact on the community, and I look forward to continue being involved,” she said. Nancy Timm and Allan Bissinger presented the Roger Bissinger Memorial Award to Joan Berenson. Allan Bissinger said Berenson’s journey as a community leader began after she returned from a trip to Israel in 1961. She has been involved with the Jewish Children’s Regional Service and Jewish Community Day School, and is a past president of the New Orleans Section of NCJW and the Federation. Berenson said any Federation award would be an honor, but receiving one with Roger Bissinger’s name on it is even more so. Kathy Shepard and Maury Herman were honored for chairing the 2017 Annual Campaign, and Miller made a presentation to Soll. “You had the wisdom of Solomon and the shyness of Israelis,” Miller told Soll, adding that Soll holds the record for the shortest board meetings.